Lawyers offered a federal jury on Tuesday two starkly different portrayals of former New York Assembly Speaker Sheldon Silver — one as a symbol of greed and corruption in Albany, the other as a respected politician who had a right to make millions of dollars in outside income. In her opening statements at Silver's bribery trial, Assistant U.S. Attorney Carrie Cohen pointed across the courtroom toward Silver as she accused the once-powerful Democrat of making $5 million through kickbacks from developers seeking legislative favors and other schemes. "Year after year after year, Sheldon Silver was on the take," said Cohen, who repeatedly intoned the words "power, greed, corruption" to describe the case. She added: "This was not politics as usual. This was bribes and kickbacks." Defense attorney Steven Molo countered by describing Silver as a champion of tenants, not developers. He also insisted his client's outside income as an attorney was legal. "Mr. Silver did not sell his office," Molo said in a packed Manhattan courtroom. "That did not happen." As he listened to the openings, Silver sometimes looked toward the jury but at other times he looked straight ahead, in the direction of a large monitor that provided him with an instant transcript of the trial. 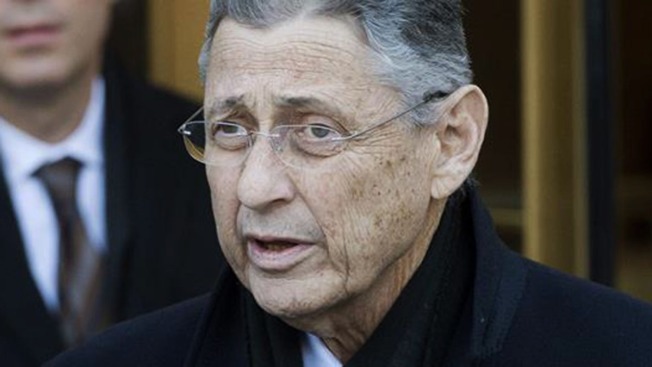 Silver, 71, has pleaded not guilty in a case that has increased scrutiny of politicians in Albany, where power has long been concentrated in the hands of the Assembly speaker, the Senate president and the governor. New York's former Senate leader, Dean Skelos, goes to trial later this month on charges of extortion and soliciting bribes. In the past six years, seven top New York lawmakers have been convicted or indicted. Prosecutors allege Silver, in his 21 years as speaker, used two separate schemes to enrich himself. In one, he collected millions of dollars in referral fees for lining up $500,000 in state grants for a doctor's research, Cohen said. In another, he pocketed even more fees by using his political clout to steer powerful developers to a law firm as clients, then falsified financial disclosure forms to cover it up, she said. Jury selection in the Sheldon Silver corruption trial has begun in federal court in downtown Manhattan. Andrew Siff reports. "For years, Sheldon Silver went out of his way to hide the scheme," she said. "He told lie after lie and kept secret after secret." Molo accused prosecutors of unfairly trying to criminalize practices long sanctioned in the state's legislature, like meeting privately with lobbyists and doing favors for friends. "They look at conduct which is legal, conduct which is normal and conduct that allows the government to function and they say it's illegal," he said. Silver quit his speaker post after his arrest but retained his Assembly seat. His trial is expected to last six weeks. Skelos stepped down from the Senate post after his spring arrest and has said he will be found innocent. In all, 31 lawmakers have been convicted of crimes or have left public service amid allegations of ethical misconduct since 2000, according to a tally kept by the good-government group Citizens Union.